24" Chain Saw Details - Quasius Equipment, Inc. 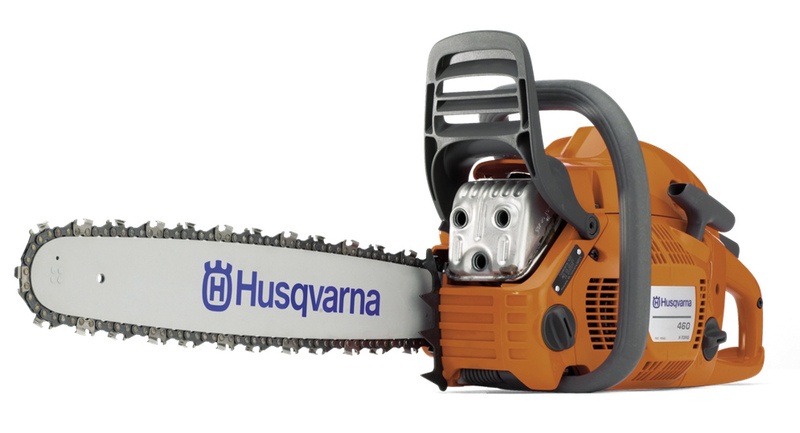 The Husqvarna Rancher 460 chain saw comes with a 24" bar and is loaded with extra power for those larger trees that a 16" saw just can't handle. This model is designed for the larger diameter wood. If you have smaller trees the 16" chain saw is a better value and easy to handle. The larger 61 cc engine puts out 3.62 HP with a power head weight of 12.8 lbs. The saw comes with an automatic bar oiler and we will provide an ample supply of bar oil which should be refilled every time the gas tank needs to be refilled. Because it is a 2 cycle engine it does require mixed fuel and oil so we will provide plenty of that as well so that you can concentrate on sawing wood rather than mixing fuel. The only additional charge is a one time chain service charge of $8.00. We replace every chain when it is returned from rental and give you a fresh chain to start your rent with. While the $8.00 does not cover the cost of a new chain, we send them out for resharpening and this covers that portion. This is a one time fee regardless of how long you have the saw. If you have a large job and want an extra chain we would charge $8.00 for each chain that is used.